Home Office cuts animal lab inspections and fast-tracks licences to experiment. The Home Office 2008 figures for animal experimentation in the UK, revealed a massive 3.65 million experiments were performed on animals. This is an increase of 454,000 procedures, 14% on 2007. 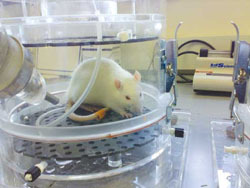 There has been a steady increase in the number of animals being used in academic experiments (speculative, no application in mind) in Universities, as well as creation of genetically modified animals, which have now reached 1.3 million experiments. Procedures included: 4,598 on primates, 6,105 on dogs, 360 on cats, 355,370 on rats and a massive 2.4 million procedures on mice. We responded with an analysis of the figures nationally and critiques of specific experiments in London, Oxford, Cambridge and Edinburgh. The following day Labour MEP David Martin and Green Party leader Caroline Lucas MEP joined us in condemning the rise. The Annual Report of the Home Office Animals Scientific Procedures Division (ASPD), released simultaneously, revealed that as UK animal experimentation escalates, animal lab inspections have been cut and licences to experiment are now being fast- tracked. The number of project licences approved by the Home Office leapt by 17%. A new fast-track system for personal licences to experiment, as well as short-term licences for students and overseas workers has been introduced – approaching 200 personal licences were fast-tracked, taking an average of just three days to process. Earlier this year we revealed how Home Office inspections of overseas monkey suppliers have permitted deplorable conditions whilst it is still claimed that we have the highest standards in the world. We have shown how commercial testing is speedily authorised with no prior scrutiny from the Home Office. Now the figures show that it is easier to use animals than it was ten years ago. The Home Office is operating a de-regulation programme at the very time Europe is attempting to improve controls. These tests are creeping up, despite increasing political consensus that they should stop. In 2008, 132 mice were experimented on to test household products. Almost 30,000 tests were undertaken for industrial products and these products or ingredients may be used in the household – so check our list. 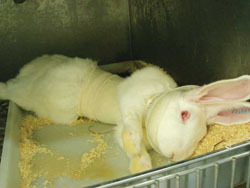 Back our Kick Animal Testing out of the House campaign to finally eradicate these tests.